Welcome back to another week of Window (of Main Street, U.S.A.) Wednesdays! Disney Legend Bill "Sully" Sullivan started his career at Disneyland at age 19 - he applied 1 week after watching the opening of Disneyland on t.v.! He started as a ticket taker at the Jungle Cruise and worked his way up to operations supervisor at Disneyland. He managed many lavish events, from the 1960 Olympics which had Disney been tasked with Pageantry, all the way to movie premieres including Mary Poppins. In 1971, Sully made his way to Florida which led to him eventually being the Vice-President of the Magic Kingdom which included responsibilities of entertainment, Guest Relations, and so much more! After he retired in 1993 after a 38 year career with Disney he said "If I had to do it all over, I'd do it all again tomorrow." Another wonderful Disney window representing a true Disney legend! 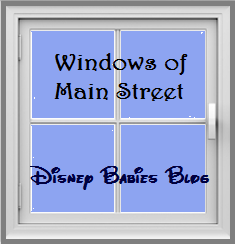 I love that you are sharing all the windows of Main Street. Such a great series! I'm ready to start as a ticket taker. I honestly think I'd enjoy any job at one of the Walt Disney World theme parks. Very cool! I love your window on Main Street series! I saw the "Windows on Main Street" book in the Writer's Stop on Monday and thought immediately of you! !